Huh! I learned something interesting yesterday, thanks to some nice sleuthing work from my frequent Win10 collaborator, Kari Finn. We’d been chatting earlier in the week, and he’d asked me to open an ISO file to examine its contents. When I right-clicked on it, the “Mount” entry in the context menu had gone missing. Then when I double-clicked the file, and 7-Zip opened, we both knew that I’d allowed that program to over-ride the default file association when it had been installed last year. 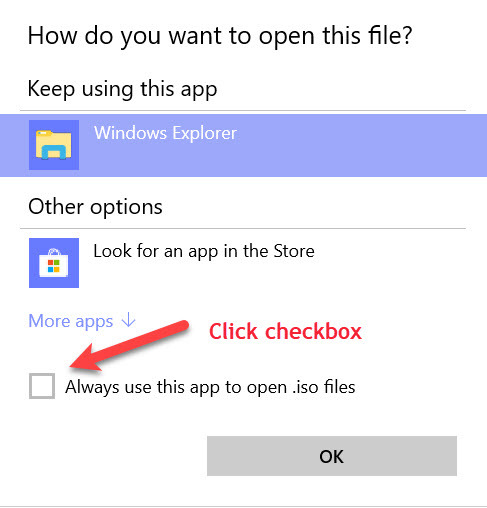 Undoing 7Zip ISO association forced me to dig into the new UWP way of doing things in Win10, so I thought I’d share that here for the benefit of other old-timers like me who might not have done it that way just yet themselves. If you click the checkbox in this window, you’ll change the file association, too. The second way to make this change is a bit more convoluted. Nevertheless, I wanted to learn how to do it the UWP way in Windows 10. This takes you through a four-item sequence of selections. 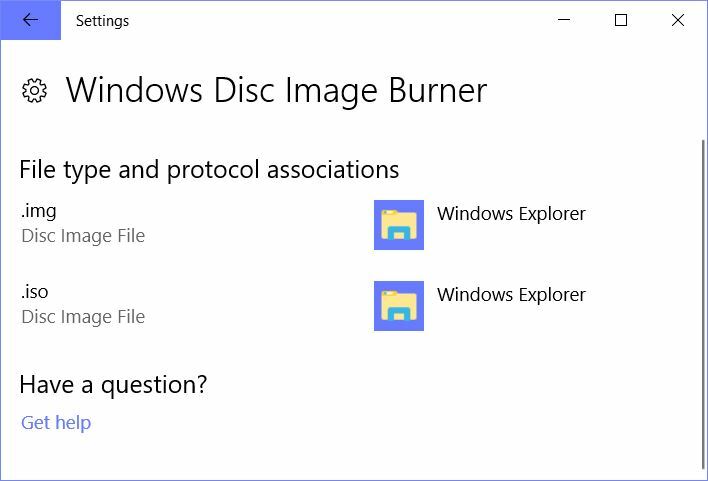 Settings → Apps → Default Apps → Set defaults by app → Windows Disc Image Burner (!). Finally, you’ll see associations for the .img and .iso (Disc Image File) file types. This is where you can make sure that, as shown, Windows Explorer appears as the default (I manually switched it from 7Zip, in my case). I prefer the preceding method, because it involves half the clicks. And now, much to my relief, when I double-click on an .iso file in File Explorer, it simply mounts the file and opens a virtual drive to display its contents. Sweet!